2016 was a year of big changes for me. While everyone seems to be glad to see the year end, I find it bittersweet. 2016 was good to me and allowed me to grow in both my personal life and professional life. I packed up my life in Illinois and moved across the country to Florida. I had virtually no family here and only a close knit group of friends. While it was hard knowing I wouldn't be with my family, it was exciting knowing that I was setting out on my own. I started a new job in a profession I never saw myself in. Training was stressful, but I learned so much and feel like I've gained several extremely valuable skills. Through training (and this job) I've also been able to meet people who have pushed me to be the best I can be. 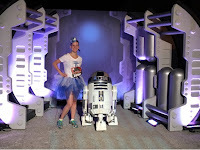 February also brought the Princess Half Marathon weekend. 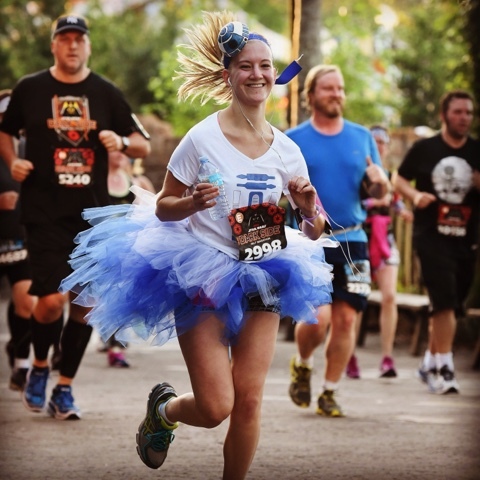 This race occurred during my training for work so I was stressed, exhausted, and so excited for everything. I wouldn't change how this race happened for anything. In addition to work and the race I also suddenly lost my Cockapoo, Max. It's still hard to think about how I wasn't able to be there with him and how I'll never be able to do the things we loved with him. Red in peace buddy. I know you're waiting for me somewhere (with your red ball or squeaky pig). Last picture of Max. Rest in Peace Bubbie. I've always had cats in my life. After the decision was made to not move Pumpkin down with me, I took it upon my self to find a cat to adopt. The requirements were it had to be an adult, have short hair, and display it knew how to use the litter box. Somehow one cat turned into two and I couldn't be happier. Cali and Bailey fit every requirement and added one that might have to be on my list in the future: they're bonded and always make me smile with their "sister act". March also brought my mom down for spring break. During her trip we hoped to get my washing machine repaired but this wasn't a goal that HHGregg seemed to have. The darn washing machine repair lasted almost two months and several hours off work. In April, I was one of a small percentage at work to pass a competency test. This pass was due to hours of study and making sure I knew my info 110%. Passing this test might go down as one of the proudest moments of my career. I also participated in the Dark Side half marathon. The race was fun and is actually one that I've signed up to run in 2017! April also brought me to my current stable. I met with our barn "ambassador" to learn about the facility and our trainer. It was during my tour that she pointed out a grey pony and commented "You would make a good team with Cupid. You're the perfect size for her". Talk about sealing my fate. I got to go home for my brothers graduation. It was strange seeing how my room had changed and not having Max around, but it was nice seeing everyone. I got to see my best friend for a bit and catch up with her (and her boyfriend) which was a major highlight of the trip. I also had my first few lessons at the new barn. It was at my second lesson that I rode Cupid and at my third lesson I made the decision to lease her starting in June. For work I achieved a major milestone where I was invited onto a team of select individuals to do more advanced work. Knowing that I had been handpicked validated my choice in accepting this job. NIU CLAS Graduation. Go Huskies! Cupid doesn't understand "stand still and take the picture"
June was much slower. I started my lease on Cupid and spent as much time with her as I was allowed. I also had my mom come visit and got to go antiquing with her. It was during this visit that she suggested I look into purchasing a house so I could get out of my shoddy apartment. I spent the Fourth of July with a friend at Altamonte Springs Red, Hot and Boom. It was a fun and cheap way to spend the holiday, plus Altamonte threw a really good event. My riding took a backseat in July when Cupid tried to jump out of her pasture. She made it but also took down the fence a injured her shoulder. So we took time off from riding and spent a lot of time cleaning her cut and making sure it wasn't infected. Because she hates being stalled and the cut was in a place that we couldn't bandage I did have to spend a lot of time cleaning dirt and other nastiness out of it. Towards the end of July I got to test if my cats were actually dog friendly with my moms two dogs, Kodi and Lucy. Poor Kodi was the first victim and we learned that my cats are so dog friendly they will back the dog up into the wall in an effort to smell him. All four animals are now able to live in peace and we've actually left them all home alone without incident. This really helps when my mom comes to visit so that she doesn't have to get a hotel room with the dogs. August brought be back into the saddle and back into biking. Cupid's leg had fully healed so I was able to start riding her again. After a brief discussion with my trainer, we decided that it was time to try Cupid at a show. 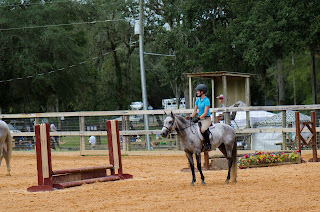 We set our sights on an upcoming show at the Sumter Equestrian Center and set to work on getting her ready. I also went and joined the Florida Freewheelers. They're a local bike club and it allowed me to explore some of the biking opportunities that Florida has to offer. Unfortunately, they cater to the road bike crew and I refuse to spend money on one. I would rather keep my hybrid and stick to local trails than bike on the road constantly. September brought my first show with Cupid. 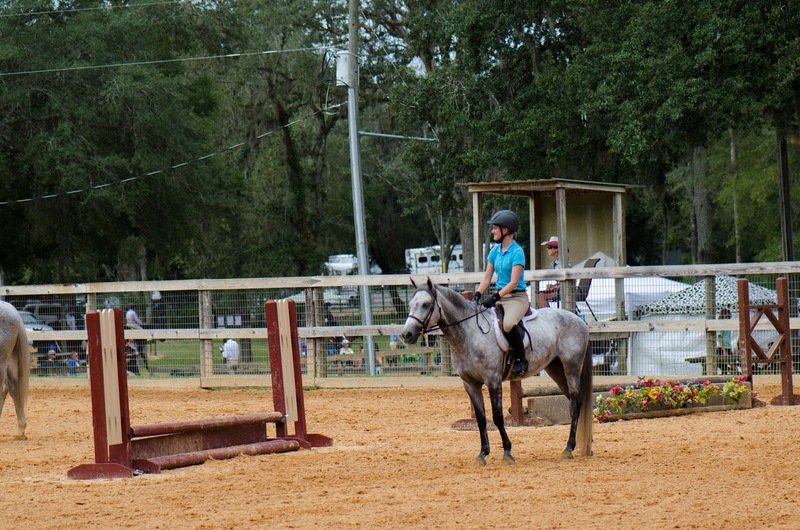 We showed at the Sumter Equestrian Center's September Hunter/Jumper, Dressage show in walk-trot cross rails, and pre-long stirrup. While Cupid and I do canter at home she hasn't gotten her leads consistently on her left side so we didn't want to set her up to fail. We took 5th in pre-long stirrup hunter on the flat, 4th in walk-trot hunter on the flat, and 3rd in both walk-trot equitation on the flat and pre-long stirrup equitation on the flat. We did scratch all of our jumping classes. On Saturday Cupid had been so exhausted by the show environment that she laid down right before we were set to do our first fence course. My trainer and I decided to scratch her for the rest of the day and I would take her out later that night to do a quick course at the open warm-up slot. We wanted to make sure that she was just tired and not sick. 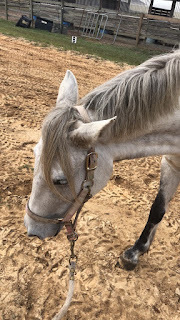 On Sunday Cupid had adjusted to the show environment so well that she was back to pulling some of her "I don't want to trot, so I'm not going to trot" stunts. Because I wanted to have a good experience showing her and not have a course where we took out every fence we decided to scratch her. Overall, we had a good experience and I now know what to expect from her. I also made my first "giant" adult decision. After the news about the UN I knew that interest rates would possibly be going up so I decided to look for a house of my own. I knew the exact neighborhood I wanted and at the end of September I put an offer out on a townhouse and had my offer accepted. The house passed the inspection with flying colors. Which brings be to October. At the end of October, I closed on my house and began preparing it to move in. My apartment complex was a complicated mess who attempted to make the whole process difficult which meant I would have my apartment until the end of November. This did allow me to paint the house and do minor work on items that I knew I wanted to change (like the gross bathroom lighting). Also in October, I went back home for a weekend to see my cousins and family. Thankfully this trip was a short one because the day before I returned home my maintenance man at the apartment decided he needed to do a repair right then and there. They entered my apartment, unauthorized, and while performing their "good customer service", locked poor Cali in the closet. Thankfully I came home the next day and was able to get her out of the closet and get her food and water. This officially marked the end of my cooperation with the apartment company and helped validate why I needed the house right away. I was finally able to move my furniture to the house in November. I also stripped and completely refinished a china cabinet that I had bought while in my apartment. The cabinet had been painted in chalk paint and took forever to remove the paint enough to take another coat. Never again will I buy an item that has been treated with chalk paint and chalk paint wax. 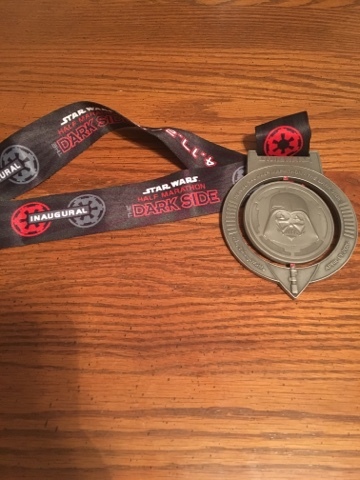 I participated in my final races of the year, the Wine and Dine Half Marathon and 10k. They were great races and I'm glad I did them, but the timing of the races has really caused me to reconsider signing up for Disney races in the future. Because I had signed up months before I didn't know I was going to purchase the house. Had I known, I would have waited and wouldn't have had a 10k and a move on the same day. Speaking of Disney, in November a friend of mine from my Disney days came down to visit. It was my first time meeting her fiance and he fit in with our group just fine. I'm so glad she found him and am so proud of her. Finally, December brought the return of Cupid. I took off October and November to have a bit of a financial break and to focus fully on my house. Seeing her and being able to work with her again was a huge relief. I also went to Battleground Orlando for the first time. It's a laser tag and paint ball course set up like a video game. We went for a friends birthday using groupon and it was totally worth it. The games they arranged were extremely fun and I was exhausted by the end. If anyone in the Orlando area is looking for a fun activity I would highly recommend it. It's hard to believe that was my entire year in a nutshell. Here's to a great 2016 and a (hopefully) even better 2017.